"[Best of Three is] another conversation game by the author of Galatea. Only this time you're not talking to a living piece of marble who can tell you about what it felt like to have her eyes drilled in, but some drama-club jerk. I don't generally care for theatrical people, so my inclination was to try to get away from this guy, but the game wouldn't let me. Doh. I also found myself feeling hampered by my conversational options: frequently the menu would only bring up one choice, often something that I disagreed with (I'm especially thinking of the "moral arbiter" line here, imperfectly as I recall it.) 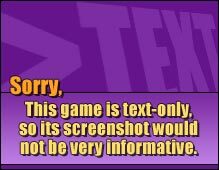 It's almost as if the game is suggesting that no one out there in the audience could possibly hold the opposite opinion, so why bother having it implemented as a response? And the thing is, I think this problem could have been remedied by making the PC either more user-definable or more extreme; as it is, she inhabited an unfortunate border zone, enough of an Everyperson that I didn't feel like I was playing a role, but with enough specifics nailed down that they clashed with what I the player brought to the character. What's more, while the conversation wasn't exactly the same from playthrough to playthrough, the same elements kept cropping up over and over again, so while there may have been just as many variants as Galatea had for all I know, I didn't feel compelled to explore them. This is making it sound like I loathed the game, which is far from the truth -- it's one of the few that captured my attention. I was just less impressed by it, on every axis, than I was by the author's initial release in this genre. And I wonder: is this a genre, or just a stopping point? When do we see conversations like this integrated into larger, not-all-talk games?" Highly recommended on the basis of technical achievements, but don't expect another Galatea in this one.